It's always nice to have a good reason to give a present to someone important to you. When you're in a relationship there are few excuses better than the Valentine's Day. To spare you a little bit of a headache we prepared a list of subjective top eight gift ideas to narrow down your search a bit. Geeks are not often known for being stylish. Help your Significant Other prove everybody wrong with this perfect blend of stylish and geeky. Admittedly, coming to a job interview or a formal dinner in an 8-Bit necktie may not be the best of ideas, but when you are going for "casual" having a partner with this accessory will instantly mark you as a fun-loving geek. Easy win. And if 8-bit is not your style or somebody grabbed the last piece befre you did, This Is Why I'm Broke has a selection of other ties for a geek determined to look at least a bit more formal. IMPORTANT: for formal affairs remember to take a high-res necktie with excellent antialiasing. An 8-bit one will not be good enough. So we've heard of the underground TV series called "Doctor Who" and supposedly it's pretty cool. It may, but doesn't have to, have something to do with this fancy mini fridge, able to hold up to six cans of your beverage of choice at a desired temperature. 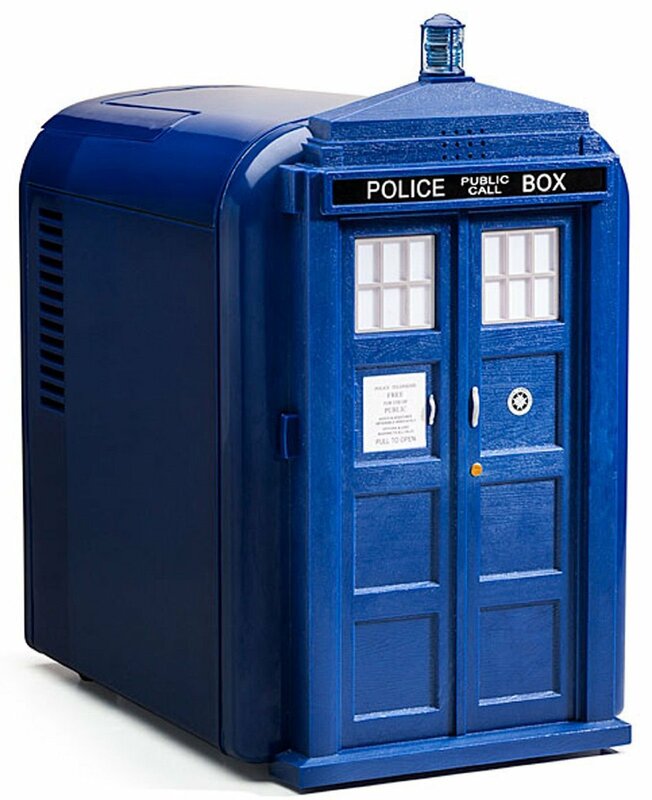 For extra fun, it makes the sounds the real TARDIS does, so you can always say that you sent the Doctor to grab some soda. The item is not of the cheapest sort, on Amazon available at just under 80 bucks, but you can't really put a price on quality geekness, can you? It's a perfect gift for a Whovian to help them enjoy a cold drink without having to move too far. And six cans worth of space means there's enough for two. If both of you are of a gaming disposition, there are quite a few games to check out, mostly of the co-op variety. One of them, and gathering stellar reviews, is Don't Starve Together. A multiplayer version of shamelessly dapper Don't Starve is a fun, challenging, and pretty (in a Burton-like way) 2D survival game set in a largely hostile and grotesque world where even the darkness is out to get you. Collect resources, build items and defenses, and try not to get each other killed, because this is not how couples are supposed to play (although its' definitely more fun). There are probably more geeky ways to drink. There are self-stirring mugs (like this one), color-changing mugs for probably half the fandoms, and meme-printed cup. But let's be honest here for a moment. 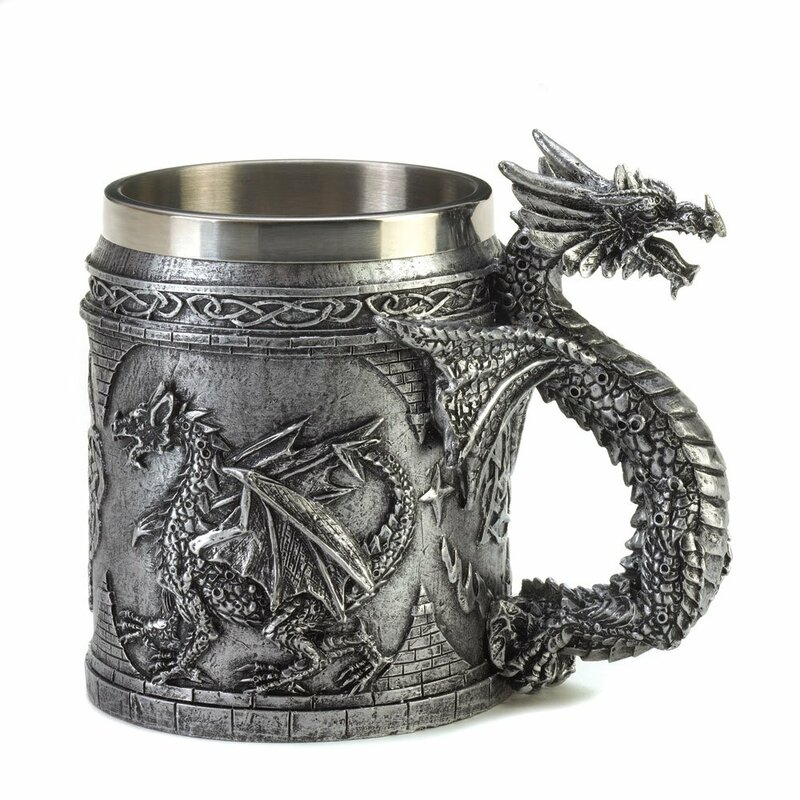 After a hard day of whatever it is both of you are doing for a living carved mugs with draconic imagery are just the way to do it. Quench your Viking thirst, and for just under $20 apiece. The sound of metal mugs clashing in toast is much better than any bell. 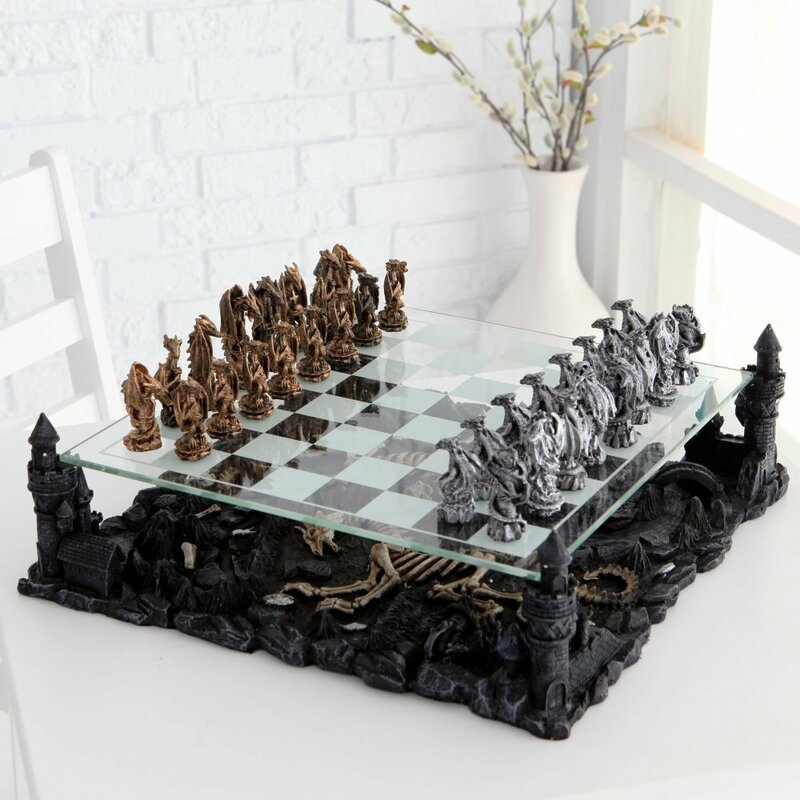 While we're on a draconic theme, why not engage your lifelong co-op partner to a game of chess with various dragons as pieces. Chess may not be the most riveting game out there, but what it lacks in speed it easily makes up with tactical depth, dignity, and the undisputable joy of outsmarting your opponent with a move so insane they were never prepared for it. It's a true game of wit and patience. Dragon chess is a whole new way of dragonslaying, and a perfect chance to show off your Dovahzul while tossing the pieces across the room. Long-distance relationships can be harsh, but thankfully the Internet is there to help communicate in a fast and convenient way. When your (or your significant other's) keyboard skills are limited largely to typical gaming WSAD layout, typing in the dark may be difficult. This is where USB lights come in. 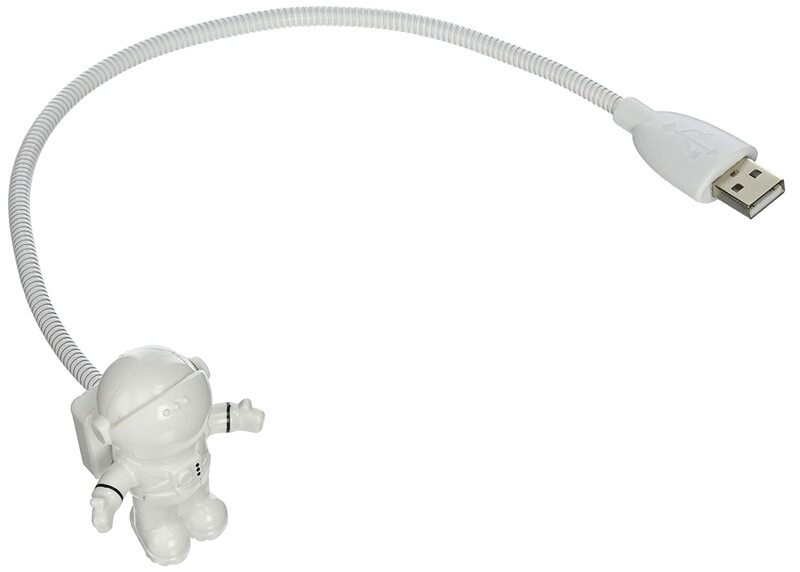 One good idea is an astronaut-shaped one, by Kikkerland. The tiny spaceman has a LED in the helmet, turning on when you open the visor. Never mistype any message again and spare yourself misunderstandings! Bonus points for a both friendly and geeky design, nothing beats being illuminated from a cosmically supercharged astronaut/energy being emitting 12 lumens of light right onto your keyboard whenever you open the visor. Another option for an aspiring gaming couple, this time significantly less challenging and more focused on delivering light-hearted entertainment. Rayman Legends is a 2013 sequel to Rayman Origins. A platforming game set in a bright and colorful world inhabited by diversely friendly and funny characters, Rayman Legends offers a wide selection of level types. One of the most interesting ones are the music levels, designed around a cover version of some well-known track. The game has a well-measured difficulty level, and a perfect co-op mode for even the most casual player couples. When you run out of lives the only bad thing that happens to you is becoming a balloon, which the other player can punch to bring you back to life. Depending on where you live, getting to spend a night under the stars may be easy as pie, technically possible, or downright unimaginable. Weather and light pollution are major problems for any aspiring stargazer. What can you do when you are dying to romantically watch some stars with your partner for life? If you are strapped for cash, you can always invest in a Star Projector. With a strong LED, a rotating base, and a couple screens you can project a starmap onto your room's walls. Admittedly, you won't get to see (and wish upon) a falling star, but otherwise this nifty gadget can save your stargazing night with a loved one from going sideways due to sudden change of weather. You can't really put a price tag on that. The eight suggestions we presented you with above are just that, suggestions. We hope you will find them useful, or at least consider them a good starting point for your ongoing search. If both of you are gamers, you can seek some Valentine's Day gaming sales. If you have some great ideas of your own (not necessarily tried and tested) put them in the comments, although it may be reasonable to keep them more or less PG so that everyone can benefit. One way or another we wish you a pleasant and memorable Valentine's Day.